A week ago, Jollibee beefed-up musical performance from Bamboo held at Craft Pub in BGC. I've been seeing Bamboo regularly because we're also watching "The Voice" but I went there to see him perform live. Besides, I want to know the latest news about the Jollibee Garlic Pepper Beef. I'm a fan of Bamboo! The Songs I love includes 214, Probinsyana, I Don't Wanna Wait in Vain and many more! Have you seen he latest Jollibee TVC featuring Bamboo? It keeps playing on my mind each time I hear it. Kind'a LSS! The song goes like this..
"Beef, Beef, Beef, Beef...sakay na kayo...kahit hanggang kanto..." the rhythm is so easy to follow; the song very Pinoy just like Jollibee's Garlic Pepper Beef. 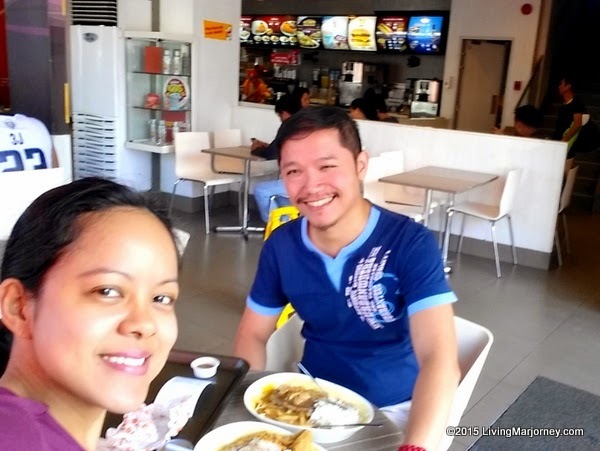 We usually have lunch at Jollibee on Sundays, right after church at GCC. I always look forward to Jollibee Chicken Joy and meaty Spaghetti (my favorite). The Ultimate Burger Steak, my husband's favorite, is so affordable that we share the huge serving of burger with special gravy, french fries and fried egg. Then, here comes the Garlic Pepper Beef, juicy beef strips in flavorful pepper sauce, complete with garlic bits. It's Jonel's substitute for Value Rice Meals whenever not available (during weekends). Going back to the "Beefed Up Jamming Session with Bamboo" last week. Bamboo performed around 8-9 songs. The night turned into an awesome intimate concert. The highlight was the jamming with him in rockeoke. Prizes where given away to the lucky group performers. The first performer and also the winning group sung "Hallelujah" They went home with signed album and Jollibee gift certificates. There's also the best female and male dressed. I was chosen as a candidate for Best in Rockstar outfit but my dear friend and fellow blogger, Ruth wore cool "astig" Rockstar attire! My husband was chosen in the Best Rockstar outfit, male category. Congrats Ruth and Jonel! Music is for everyone and Jollibee caters to all! Even the ladies sung with Bamboo and I'm so happy joining group four. We sung "Tatsulok". I knew the melody but not so familiar with the lyrics but hey! Bamboo was there to guide us! During the interview, I got the opportunity to ask his favorite Jollibee dessert. He said it's the Sundae but not before concerts and performances. We have the same favorite, but I have to add Peach Mango Pie though! Oh, look at that! The Woman in Digital meets Bamboo! Posted on Bamboo's official IG account. Bamboo not only performs on stage, he connects with the audience. It was an intimate performance with as little as 50 guests. Thank you Jollibee for having me!